The Town of Ocean City accepted a generous contribution from the Ocean City Lions Club on Wednesday, October 10. Past O.C. 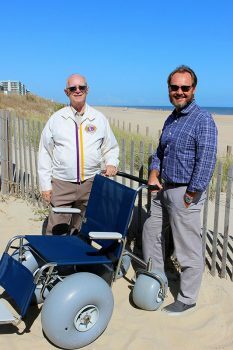 Lions Club president, Sean Williams, and current club president, Norman Cathell, presented the town with a wheelchair donation for the Beach Wheelchair Program. The Beach Wheelchair service is free, thanks to the donations made to the program throughout the year. Beach Wheelchairs are available Memorial Day through Labor Day and distributed on a first-come, first-served basis from 10 a.m. to 5 p.m.